This is what the far end of my laundry room looked like only a few weeks ago. Beautiful, no? Sick of hating it, I finally finished painting it white, painted and reorganized the dresser, and then last weekend I built this wood counter. Next step: sewing a fabric skirt to hide all my junk. I almost ordered this fabric, but hesitated because in my heart of hearts what I really wanted was a large-scale floral in punchy shades of blue and yellow. So then I got the crazy idea to google something along those lines and came up with the name Thomas Paul, at which point I promptly fell in love with his fabric line and started searching all corners of the interweb for any of his prints under $25/yard (too rich for my blood!). My heart skipped a beat when I found some for only $12/yard here (I don’t see it listed currently, so the yardage may have sold quickly at that price!). I ordered it Wednesday and it was here Saturday. Winning! I bought two yards, and since my counter is 36″ off the ground I started by folding it in half and cutting it into two pieces (after washing and drying it first, which you should do before cutting or sewing any fabric you plan to wash later). Pistachio helped. Then I broke out a clean towel and my iron and pressed the sides–using the selvage edge of the fabric as a guide to fold it over twice. I used a file folder as a guide for folding over the top edge. I needed the length and I knew no one would ever see this edge so I just folded it over once and only maybe half an inch. I left the bottom edge alone for now so I could hem it to the right length after testing it out in place. I also held off on sewing anything just in case I needed to make changes. Y’all know I like to keep it real so I’m not even going to act like everything went smoothly with this project. It didn’t. Everything went wrong but it all turned out well in the end. My original intent was to create a more tailored look, with the fabric hanging straight down in the front and a box pleat in the middle, but when I got my fabric and mocked it up with painter’s tape holding it to the underside of the counter it just didn’t look right. I decided to go for a gathered look instead, but the most obvious solution for hanging (a tension rod) would be too chunky. I needed something long and skinny. So this was my brilliant plan. I was so proud of it. I found this 1/4″ by 10 foot metal rod at Lowe’s for under $5. I got my friend Cassie’s husband Nic to cut it to length for me with the intent to mount it on the underside of the counter with some cup hooks I already had on hand. Then I used some curtain clips I already had (these from Ikea) to hang my fabric panels. I wasn’t really loving how it looked, but the bigger problem was that the clips were not sliding on the rod, like, at all. When I tried to move the curtain out of the way to access the litter box the clips popped off the rod or the rod popped out of the cup hooks or both. It was way too annoying. Okay so here was my next brilliant plan. I sewed a pocket at the top of the panel to slip onto the rod. I don’t know why I used that navy thread. It was already in the machine and I sold myself on the idea that contrasting thread would look cute because I was too lazy to change it. I just did one panel so I could test whether it worked before sewing both panels. It looked alright up top, but now the bottom was barely grazing the floor (and I hadn’t hemmed it yet). Then I got the idea to make it a little longer by sewing a wide ribbon in half long-ways and sewing it onto the top of the panel to act as a pocket, but it looked so awful I didn’t even take pictures. And somewhere along the line my sewing machine got all out of whack and my navy stitches were looking all loopy and messy. So I ripped out those stitches, switched to white thread, adjusted my tension, and sewed a hem around the edge of both panels. Then I did what I should’ve just done from the very beginning–I stapled the fabric to the underside of the counter. I just held it so the bottom edge barely grazed the floor with one hand and stapled with the other, creating soft folds as I went. I can easily access the contents underneath by just flipping the fabric up onto the countertop. This is sooooo much nicer than what I’ve looked at for the last three years. Seriously, how did I not think of these changes sooner? This room is so much prettier and more functional now. 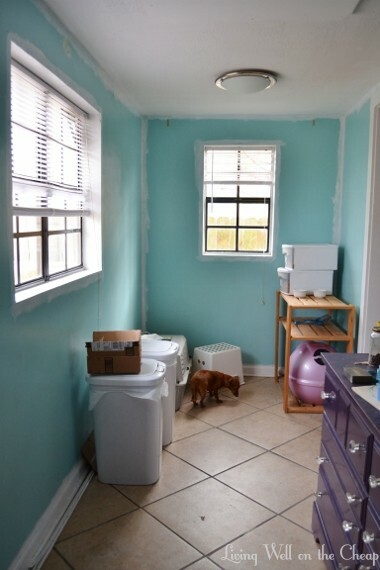 And I’m not even done yet–I still want to add some pretty canisters for pet food, shelves or artwork above the counter, and new shades on the windows. The only downside to having the fabric stapled on is that I can’t easily take it down to be washed (especially given its proximity to the litter box and Pistachio’s rather creative methods of expressing her feelings), but I can always pry the staples out in case of CATastrophe (see what I did there?). Hopefully cats and curtain will live happily ever after and a run through the washing machine will never be necessary. I’ve added even more function since taking these photos by stashing some more big, ugly stuff under there, like our reusable shopping bags and stash of extra paper towels (though I do think paper towels can look pretty sitting out on a shelf if they’re plain white and removed from their packaging). 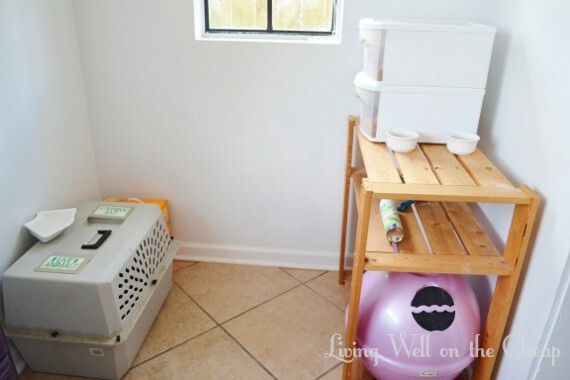 My next project will be a pet food station (our current setup is creatively cropped out of the photos above). I hear places like Marshall’s and Burlington often have pretty pet food canisters for a fraction of what you’d pay at a place like Ballard Designs or Pottery Barn. And of course I’ve thought about DIYing some. We’ll see what I come up with! This is awesome!! I love how you told us your errors, it is good to see the mistakes and then the final result of it! The table and fabric are both beautiful and compliment each other. Thanks for sharing! Gotta keep it real! My projects definitely don’t always go as planned but I’m really happy with how this one turned out. Glad you like it too! I just found your blog and I am loving it! Love the fabric that you used here and I can totally identify with projects not going as planned. Quick question: Does your cat have any problems accessing the litter box? I am guessing no, but I have this huge fear that if I make the litter boxes too much of a hassle, the cats will stop using them. True story, my cat was on Prozac for awhile. So I might not be dealing with the most normal of kitties. Hahahaha! One of my cats likes to express her feelings rather creatively, but as long as the litter box is kept reasonably clean she’s fine. They don’t seem to mind the curtain at all, and I like to think maybe they even appreciate the extra privacy! I would love to see yours! I thought about using velvro here but I wasn’t sure it would work right. You’d have to see it for me to explain why but at least the fabric seems to be holding up great so far! Fabulous! I love the counter itself, especially with the dark wood. And that fabric. . . I’m going to have to buy up the stock and make curtains, sheets, pillowcases, throw pillows, everything with that fabric. It is so cheerful and just plain pretty. Such a smart solution to a very common problem. Thanks so much! I LOVE the fabric too! I was really lucky to score it at a great price.